After their disheartening last-place finish at the London games in 2012, the Team USA Field Hockey needed to radically revise its preparation and game strategy. So, in an effort to overhaul the program it moved its home base from Chula Vista, CA, to Lancaster, PA. This location change brought with it a state-of-the-art sports facility, the Spooky Nook, featuring a temperature-controlled sports dome and water-based turf. Remya Meixer, who played Lockhaven University in late 70s, had a different experience than the young Olympians. Most fields for college women were dry, pock-marked and unfit for play. Before Title IX, colleges and universities were not mandated to equitably distribute funds between facilities designated for men and women. Men’s sports like football, soccer, and baseball went front and center, and women’s sports like Field Hockey went on the sidelines. “Title IX led to the Olympic women’s field hockey team.” said Sally Goggin, National Development Director of USA Field Hockey, the official organization of Field Hockey in the United States. The new supply of funds for women’s sports teams in colleges created the demand for professional players. According to Goggin, “Prior to that time, Field Hockey played in high schools only in the fall.” As a single-season sport, field hockey just was not in demand. No demand meant no pipeline to the Olympics. After the 1990 Olympics, USA Futures, a pipeline program designed to send field hockey players to the Olympics, was born. Futures is a 3 month program that identifies and trains athletes for international competition. 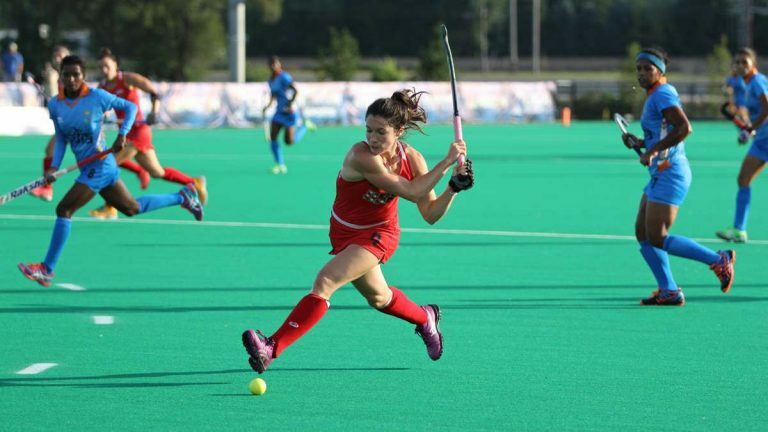 “That program and the college demand created club field hockey,” said Goggin. Goggin says that club sports is important because, as opposed to a single season in high school, it is a year round training cycle. Currently, only 20 states have high school teams. Goggin and other players are making a big push to increase that number through clinics. That push also comes from junior players like like Maddie Spolorich from Sommerville High School. Spolorich plays for USA Futures as a U-17 player. With more players like her, the sport could be in all 50 states.